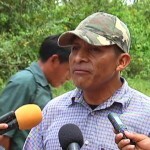 For months, tensions have been mounting between SATIIM, the Sarstoon Temash Institute of Indigenous Management, and US Capital Energy Limited that is carrying out pre-drilling activities within Maya communal lands in the Sarstoon Temash National Park. 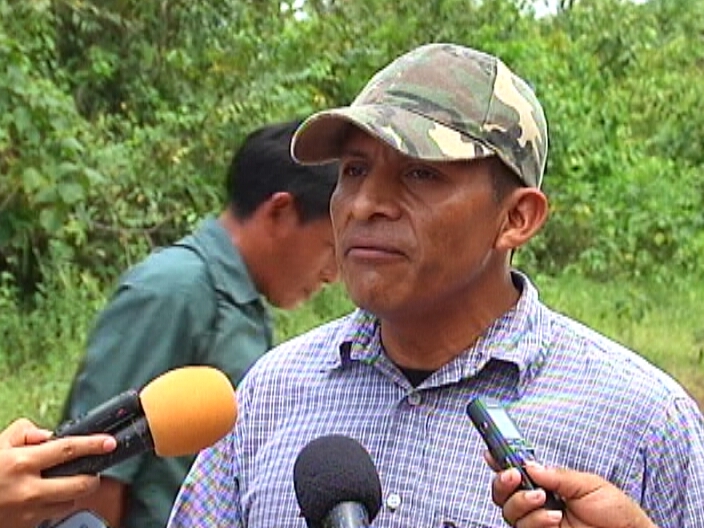 On Wednesday, despite numerous court rulings affirming the rights of the Maya on communal lands, Government waived the expiration date of the permit granting the oil company entry into the protected area. 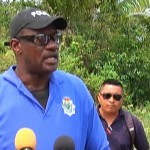 On the heels of that decision, on Thursday, representatives from thirty-eight communities headed to the village of Sunday Wood, one of five buffer communities and an access point to the operation of US Capital Energy in the area. 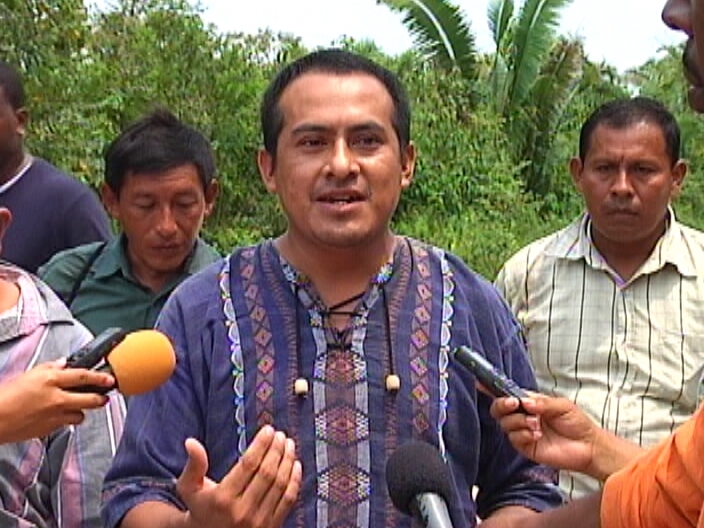 The undertaking was no easy feat for the Mayas, who, already feeling disrespected and insulted, had to obtain permission from the oil company to get to their own communal land. 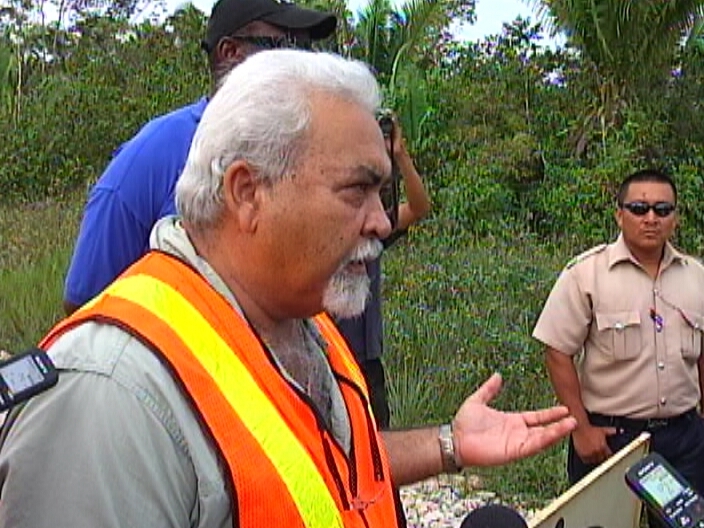 News Five’s Isani Cayetano was on the scene and has the following report. A concert of voices, albeit joined in various iterations of prayer, is the climax of an excursion to Sunday Wood. 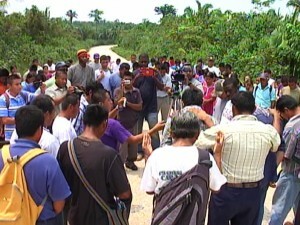 Men, women and children, approximately a hundred villagers from across the indigenous Maya community, have congregated along this seven-mile stretch. In their native tongue supplications are being recited, seeking moral and spiritual guidance to resolve an ongoing conflict. The symbolic gathering is an act of rebellion against the powers that be. 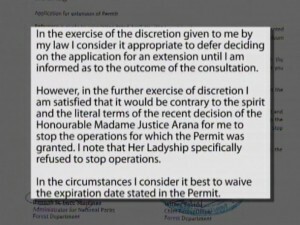 It is a day after the Government of Belize issued a letter waiving the deadline for a permit granted to U.S. Capital Energy to conduct exploratory work within the Sarstoon Temash National Park. 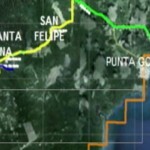 Since its arrival a few years ago, the multinational oil company has found itself in a fix with the buffer communities fringing this protected area. 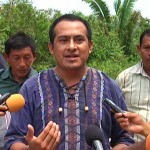 Despite successive rulings by the Supreme Court, affirming and endorsing communal land rights, the Maya of southern Belize are repeatedly disrespected. Notwithstanding that decree, permission to enter the national park from this particular access point has to be sought from U.S. Capital. 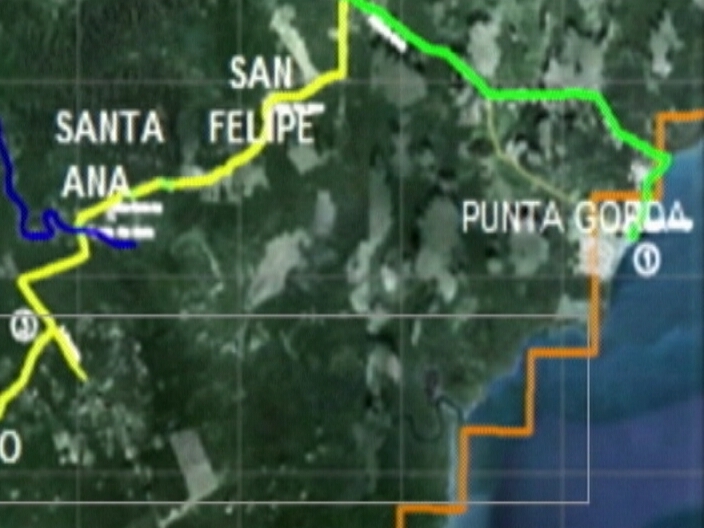 As part of its work within the area, the company has constructed a rock-strewn road leading to the A1 drill site. Today, a delegation of leaders from the thirty-eight Mayan communities has journeyed to Sunday Wood and its members are intent on crossing the restricted entrance. In spite of the likelihood of injury caused by having children wandering around the location, a brief conference among themselves returned an ultimatum. 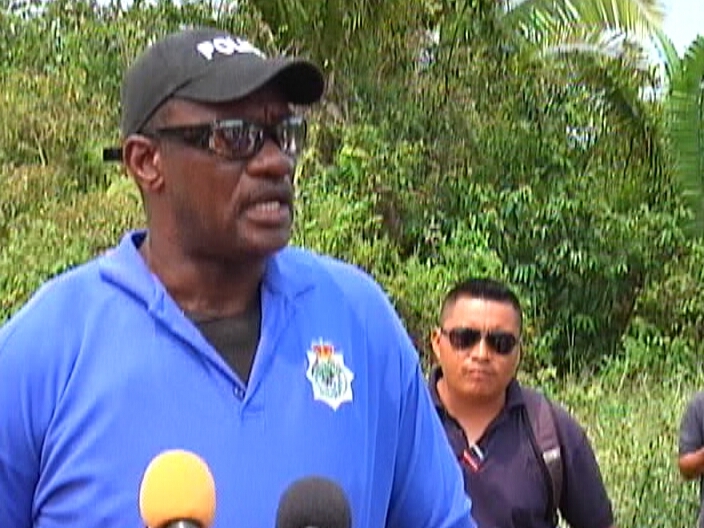 Before long, the police, who remained on standby since receiving word of the crowd’s intention, would become involved. Regardless of the answer which Inspector Ernel Dominguez attempted to give, the crowd would hear nothing of it. Instead, he cautioned MLA’s Program Coordinator Pablo Mis, as well as President of the Toledo Alcaldes Association, Alfonso Cal. And with that the throng stormed the access, proceeding on foot a distance shorter than half a mile into the territory, before stopping abruptly to hold worship. The idea, from the onset, however, was to understand the lay of the land, as it concerns U.S. Capital’s activities within the Sarstoon Temash. Reporting for News Five, I am Isani Cayetano. My Mayan people I will tell you again this is not the fight to pick how come I don’t see chuc and Pablo mis the stand up like this when the Guatemalans the go with our forest or with our gold or with anything else it’s because these individuals want money that’s the whole premise of this fight unu pick wa fight with the Guatemalans not with these people you are making us look bad. Choc. 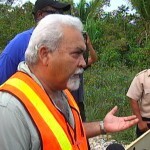 And Pablo mis you are certainly making us look stupid now stop unu nonsense and go protect our forest from the poaching Guatemalans fu the last time I di tell unu..
We are doing our part here defending our land, you should take you foot out of your mouth and do your part and go and stop the illegal loggers – mf. 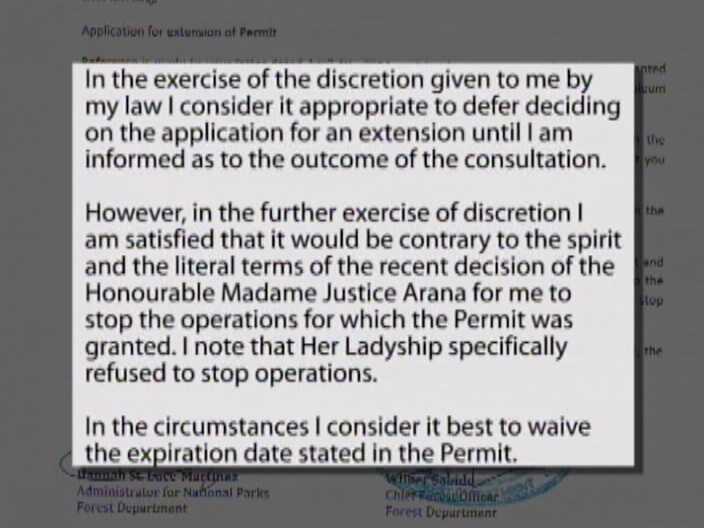 This is unbelievable, how can a foreign company come to Belize and restrict access to their communal land?!! This guy Tewes tells them there’s a swamp back there. Don’t you think they know it? Haven’t their ancestors been going there since before the buccaneers even arrived on these shores? Even more unbelievable is that the government would allow such a thing. 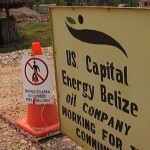 Let’s put it in perspective, would the American government blatantly disrespect it’s citizens and allow a Belizean company to drill on Native American land? I agree with the Mayan brothers. It’s time that we stand up to the greedy capitalistic behemoth swines from the north. This is not Iraq. 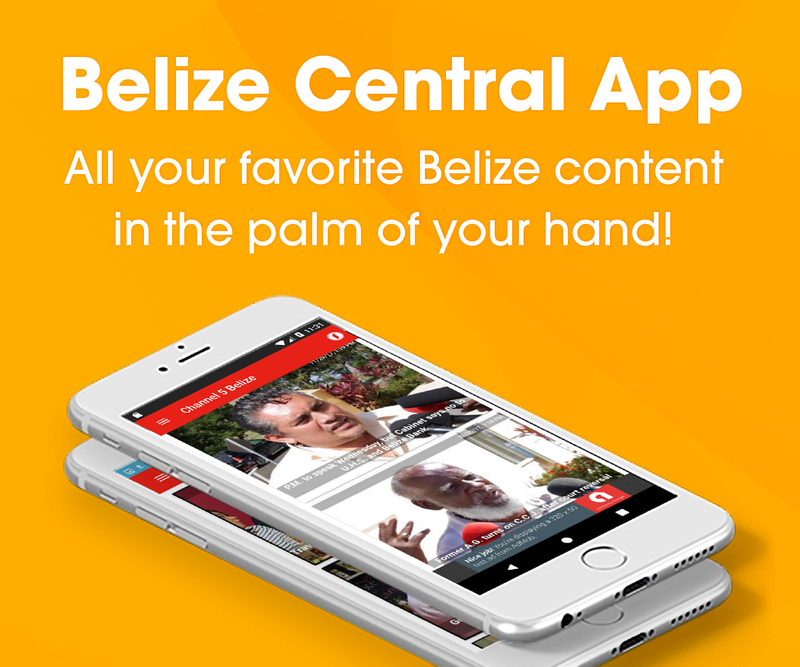 Dis da Belize. The foreigners are chancy but the Indians will surround them and eliminate them like Custer at Little Big Horn. It’s unacceptable in the 21st century to disrespect the rights of our Mayan brothers just because of money and cheap oil to feed the US economy. 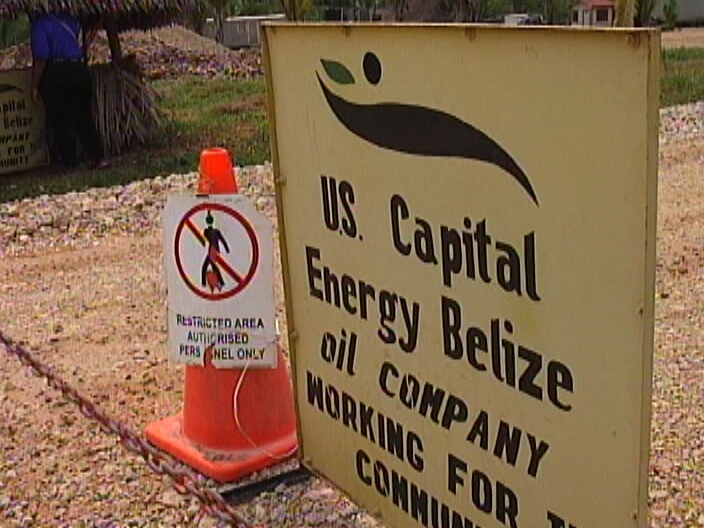 I’m sure the Belize government is allowing drilling to continue-despite the supreme court ruling- because they have already accepted large sums of money from the gringos. This is how how the US capitalists achieve their goal all over the world. They send operatives with suite cases of money to bribe politicians to do their dirty work. They did it with Arbens in Guatemala, El Salvador, Honduras, Iran and many other countries – didn’t work out so well in Cuba- thanks to Fidel. Big US companies make huge contributions to politicians who influence congress to corrupt other governments. They send operatives – CIA – to buy off local politicians to achieve their goal (cheap oil). This is what is happening now in Temash. Di white man di come again. I support the Mayans. My roots are in Barranco and I have sons with Mayan women who are ready for Little Big Temash. Unu come. The fuse on the powder keg has been lit; if the greed for money does not subside in the near future it will explode.